Beginning with 'abstenencia', it has in its upper margin an inscription identifying it as "the book of Richard de Bury, bishop of Durham, who had it written in London." Each entry begins with a reference to the source: 'abstenencia, Gen. vii' (citing the chapter--by a medieval system of divisions--of Genesis). 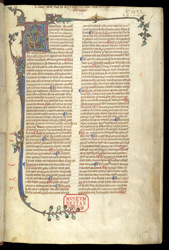 Each subsection is marked with a red or blue paragraph mark and, to the right of the first column, the first word of each is written in red, probably as a further aid to the reader. The tiny symbol 'ai' in the lower right corner was an aid for the assembly of the manuscript's pages.